Overton James was born in 1925 in Bromide, Oklahoma. He had a small stint in the U.S. Navy before returning to Oklahoma to earn his bachelor’s and master’s degrees in education from Southeastern State College. In 1963, James was appointed as Governor of the Chickasaw Nation by President John F. Kennedy. At the time, he was the youngest person to ever serve in that position. After serving as a presidential appointee, James was then elected to four consecutive terms by the citizens of the Chickasaw Nation. During his tenure he campaigned for several improvements and funding from the federal government. Under James, the Chickasaw Nation adopted a new constitution in 1979. He also helped establish a health care facility in Tishomingo, the first for the Chickasaw Nation. He resigned as governor in 1985, when he was succeeded by Governor Bill Anoatubby. "Overton James served the Chickasaw people during a crucial turning point in our history as a nation. 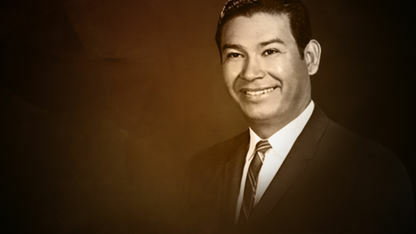 Appointed governor by President Kennedy in 1963, Overton James helped lead the Chickasaw people out from under the control of the federal government into a new era of self-governance. As the first elected Governor of the Chickasaw Nation since Oklahoma statehood, he helped blaze the trail for the success we enjoy today. His leadership was vital to the birth of a political and cultural resurgence which is continuing to transform the Chickasaw Nation.